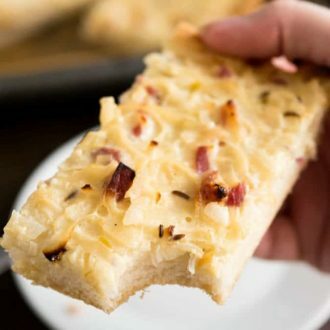 This Onion Tart is made with bacon and a really big amount of onions! It tastes best lukewarm with a glass of wine or some freshly squeezed grape juice. Pour the lukewarm milk into the bowl of a stand mixer fitted with the dough hook attachment. Dissolve the yeast in the lukewarm (90°F) milk. Cover and let sit until the yeast is foamy, about 5 to 10 minutes. On low speed, add the flour, sugar, vegetable oil, and salt and knead until a soft dough forms about 5 minutes. Transfer the dough to a lightly floured surface and knead with your hands for one more minute. Sprinkle the dough with a little bit more flour if it's too sticky. Transfer the dough to a lightly greased bowl, cover and let the dough rest at a warm place for 40 minutes or until about doubled in size. In the meantime make the onion topping: Fry up the diced bacon. When the bacon is done add the diced onions to it. Reduce the heat to medium-low and let the onions slowly caramelize to a nice golden brown, about 10-20 minutes. Remove from heat and allow the mixture to cool for a few minutes. In a bowl, combine sour cream, eggs, salt and caraway seeds. Add the onion mixture to it and thoroughly combine everything. Grease a 18x13-inch baking sheet or use parchment paper. With floured hands spread the dough evenly about 0.2 to 0.4 inch high. Spread the onion mixture on top of it and sprinkle a few caraway seeds on top. Preheat the oven to 390F (200C) and let the onion tart rise a second time while the oven is preheating. Place the Onion Tart on the middle shelf in the oven and bake for 25-30 minutes, until the top is light brown. Let cool for a few minutes before serving. This tart tastes best lukewarm.